As keen-eyed readers may have noticed, I am currently undertaking a read-through of Iain M. Banks' Culture novels. Whilst trundling around the Internet I noticed that quite a few people are puzzled over the best reading order or the chronological order of the series, so I set about assembling this guide, with a few notes. The Culture novels are all stand-alone stories separated from one another by decades and centuries of time and thousands of light-years of space, so you can pretty much read them in whatever order you wish. Note that The State of the Art refers to the titular novella of the collection, not the other two Culture stories in the book. I could be wrong (not having read them yet), but I believe the other two stories and Inversions lack any information that can be used to reliably date them at all. The appendix to Consider Phlebas gives the date for the beginning of the Idiran War as 1327 AD and the book takes place four years later. Excession takes place 400 years after the war ends. Matter takes place over twenty years after the Sleeper Service vanishes (which happens at the end of Excession). The State of the Art features a Contact group surveying Earth in 1977. One of the same characters turns up in Use of Weapons 115 years after the mission to Earth. One of the ships in The Player of Games is 716 years old and was built at the end of the Idiran War (so near the end it never engaged in combat with the enemy). Finally, Look to Windward takes place 803 years after the Twin Novae Battle, one of the final space battles of the Idiran War. According to Consider Phlebas' appendix, the Culture contacts Earth some time around 2100 AD. I recently discovered your blog and wanted to drop a note to say how much I'm enjoying it. I was in the bookstore a few days back looking at Iain M. Banks novels (after seeing Matter show up on some 2008 best of lists), but didn't know where to begin. So, thank you for your reviews of his Culture books and for putting them in order. How do you feel Banks compares to other current space opera novelists such as Reynolds or Hamilton? Personally, I feel that Player of Games works best as an introductory novel, followed by Use of Weapons. Is Inversions a Culture novel? I should have put a sources thing up for the timeline, which I will do shortly. But the dates come from the books themselves and the references to events in the others (usually the Idiran War, which is helpful because the appendix to Consider Phlebas gives detailed dates for that conflict). As a prose stylist, Banks is definitely a lot better than Hamilton and a bit better than Reynolds. He mixes things up and is more varied than either. However, because he doesn't write sequels he can't get into as much depth about his ideas as the other two. Also, the Culture is insanely advanced and there isn't much it can't do, which sometimes means there's less tension to his books than the other two. In terms of overall quality I'd rank the three pretty close together, although I admit to being more of a fan of Hamilton's massive and page-turning SF blockbusters, even if Banks is the better writer. I haven't read it, but my understanding is that INVERSIONS is a Culture novel purely from the POV of an unContacted race. It's the reverse of THE STATE OF THE ART, where we see what happens from the Culture's POV when they visit an unContacted Earth. Because of this (the word 'Culture' appears only once in the novel), INVERSIONS is not marketed as a Culture book. Banks' allegedly non-SF novel THE BRIDGE is also technically a Culture book because a knife missile shows up at one point, but that link is a bit too spurious for most people to accept it as such. Inversions is a fantasy like novel in a feudal world on the verge of great changes after some meteorites struck it and destroyed its dominant Empire which has been replaced with smaller successor states. One bodyguard at the court of a Cromwell like figure, and a (female in the patriarchal world) doctor at the court of the neighboring traditional king are not quite what they seem. Thanks for your insights on Reynolds, Banks, and Hamilton. I've read some of Reynolds' recent short stories ("Minla's Flowers"; "The Sledge-Maker's Daughter"), which I think are excellent; I just started a short story by Hamilton ("Blessed by an Angel"), so no thoughts on him just yet. Looks like I'll be picking up Banks' Consider Phlebas this week, on your (and Liviu's) recommendation -- and I sense that I'll then be playing catch-up with the rest of his Culture novels. Regarding Hamilton's novels, any suggestions on where to start? Thanks for putting your sources up, that is helpful. However, are you sure that Excession takes place only four hundred years post-Idiran war? Where is this referenced in the book? In fact, I've just done a quick bit of research and I've been reminded that within the novel is a reference to 'the Azadian affair' as an example of what happens when SC gets things fairly disastrously wrong; therefore Excession must take place after The Player of Games. I think you're basing your assertion that Excession took place 400 years after the Idiran War on the age of Pittance, which was c.500 years old; apparently though, it had been around 200 years after the war that the decommissioning and storage of Culture warships was fully carried out. 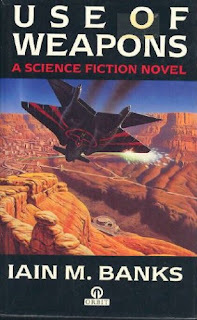 With Hamilton you can start with MINDSTAR RISING (the first in his Greg Mandel series), THE REALITY DYSFUNCTION (the first in the Night's Dawn Trilogy), FALLEN DRAGON (his only 'proper' stand-alone), MISSPENT YOUTH (a stand-alone semi-prequel to his Commonwealth books) or PANDORA'S STAR (the first 'proper' Commonwealth book). If you're after a near-future detective story, I'd go for MINDSTAR RISING, or THE REALITY DYSFUNCTION (for my money his best novel) for the vast-canvas, huge space opera stuff. Regarding EXCESSION, I'll have to revisit that. I read the book ages ago, but it does look like you can maybe fudge the date to after PLAYER OF GAMES with a bit of fiddling around. Thanks for your tips on Hamilton! After a little poking around, I think that I'll start with Mindstar Rising (if I can find it, as it seems to be out of print) and Pandora's Star. Yeah, I'm spacing out Banks' books between other works. I took this approach with George MacDonald Fraser's FLASHMAN books three years ago and it worked really well (fantastic books but you wouldn't want to read all 12 of them in a row). THE STATE OF THE ART and USE OF WEAPONS are next up on the Banks reading list. You say "Matter takes place over twenty years after the Sleeper Service vanishes (which happens at the end of Excession)." I think it's actually Gray Area that disappears into the Excession, not Sleeper Service. Dont read them one after other. Not a series and too good:: subtlely different some quite a bit, e.g excession&feersum endjinn, both cracking books.Humbly suggest authors: Neal Stephenson, China Meiville, Ken Macloed and Nial Gaimann for interval reading. A series PATRICK O BRIEN. anyway. Banksy is subliming...I will so miss him. Lament. "(The following three passages have been extracted from A Short History of the Idiran War (English Language/Christian calendar version, original text 2110 AD, unaltered), edited by Parharengyisa Listach Ja'andeesih Petrain dam Kotosklo. The works form part of an independant, non-commissioned but Contact-approved Earth Extro-Information Pack.)" "The only desire the Culture could not satisfy from within itself was common to both the descendants of its original human stock and the machines they had (at however great a remove) brought into being: the urge not to feel useless." The fact that the culture originated from "human stock" seems to imply that we are indeed the origin of the Culture, yet that 2110 AD date is admittedly an odd reference. I suppose Banks could just be allowing himself the same vague use of alien "humans" that many sci-fi authors do? I've read the first two books (Phlebas and Player) so far, and did so under the assumption that the Culture stemmed from Earth. I find it a little disappointing if that wasn't the intention. No. Earth joined the Culture much later. The story THE STATE OF THE ART is about a Culture first contact team visiting Earth in the late 1970s. The timeline in CONSIDER PHLEBAS also states that the Culture-Idiran War took place in what is our 14th Century, so obviously the Culture was not founded by us in the future. The 'human stock' reference is, I believe, a reference to the fact that several of the founding and current races of the Culture are very humanoid in appearance, but they're not humans as in people from Earth. Does the first book serve as an introduction to the world or the Culture? As good a one as we ever get. Pages and pages of exposition on the history of the Culture is not Banks's style. Where does Surface Detail fit in the chronology? The Culture does not come from us. More likely, we come from them, or a single shared source, or convergent evolution. Culture are humans, not Terrans. Not from Sol.